O ne September night a family had gathered round their hearth, and piled it high with the driftwood of mountain streams, the dry cones of the pine, and the splintered ruins of great trees that had come crashing down the precipice. 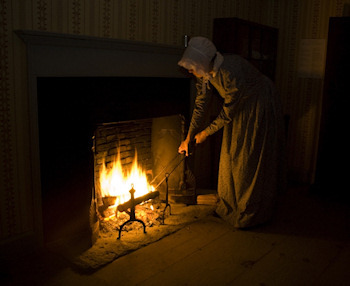 Up the chimney roared the fire, and brightened the room with its broad blaze. The faces of the father and mother had a sober gladness; the children laughed; the eldest daughter was the image of Happine ss at seventeen; and the aged grandmother, who sat knitting in the warmest place, was the image of Happiness grown old. 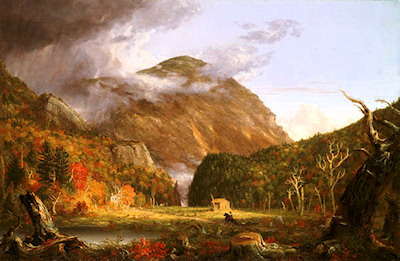 They had found the "herb, heart's-ease," in the bleakest spot of all New England. 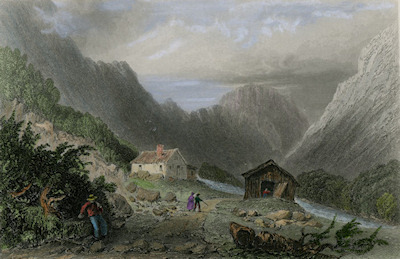 This family were situated in the Notch of the White Hills, where the wind was sharp throughout the year, and pitilessly cold in the winter,--giving their cottage all its fresh inclemency before it descended on the valley of the Saco. They dwelt in a cold spot and a dangerous one; for a mountain towered above their heads, so steep, that the stones would often rumble down its sides and startle them at midnight. 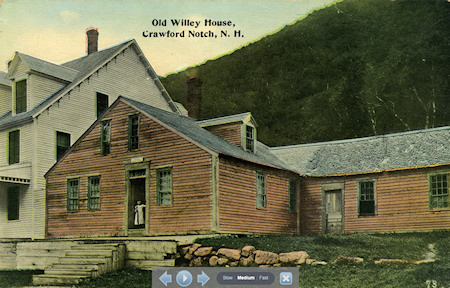 Old Willey House, Crawford Notch, N.H.
Nathaniel Hawthorne's inspiration for the Ambitious Guest.